And then a college professor showed up and left me so confused about left and right that I couldn’t fathom how anyone could rightly know which was which. The professor moved on, but his question really started to bug me. 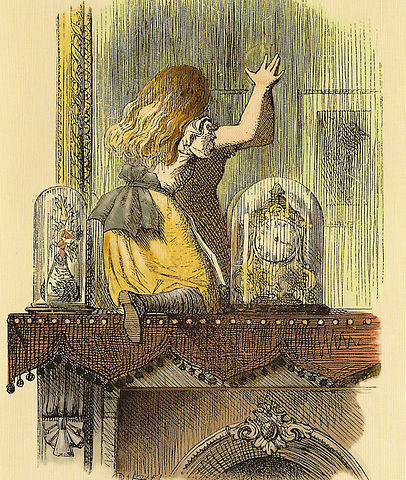 Imagine that you’d been born on the other side of Alice’s looking glass, with your entire universe a mirror image of our own. Clearly, right and left would be reversed: hearts would sit on the right, English would read right-to-left, and so on. But how would you know you were in that universe, rather than ours? Our eyes and even our brains would all be flipped, too! This isn’t merely a question of which direction gets which label; it’s an assault on the very concepts of left-ness and right-ness. Was my three-year-old self gloating over his mastery of a vacuous, meaningless convention? 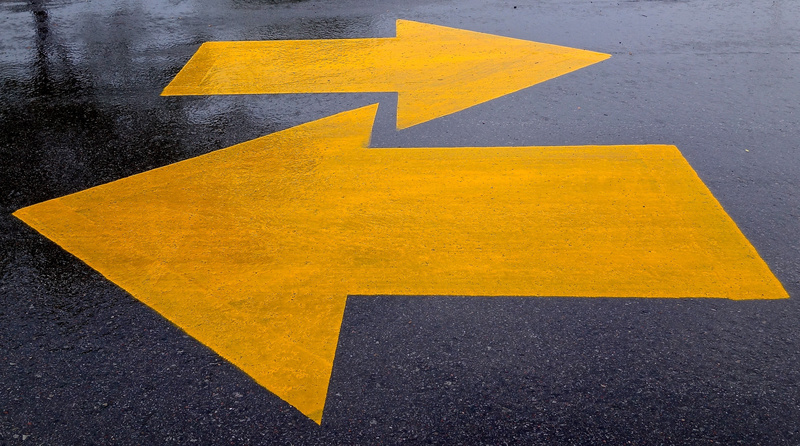 We may think we know our right from our left, but does the universe agree? If you want to know what a word means, the obvious first stop is a dictionary. Martian: Excuse me, what is left? You: Oh, left is just the side that’s turned west when you’re facing north! Martian: Ah. Um. I know that if I face the direction of my planet’s rotation, ‘west’ is the opposite direction. But what is ‘north’? You: OK, so to find north you just face west and turn right, and—oh, goddammit! Other dictionaries exploit the convenient fact that human bodies are not symmetrical. Merriam-Webster, for example, suggests “the side of the body in which the heart is mostly located.” That definition might work here on Earth, where, by medical necessity or murderous intent, we’ve torn open enough bodies to know where hearts reside. But what would a Martian know of human anatomy? Of course, for Mars we could simply send over a compass or a cadaver. But surely “left” ought to mean the same thing even on the other end of the universe! Besides, pointing at a physical object can’t help us distinguish our universe from its mirror image; the mirror version of us could do exactly the same thing with their mirror compasses and bodies and be equally convinced that they’d defined “left.” We need a definition that doesn’t rely on sharing physical things. An answer finally began to emerge a few years later, when I interned at a particle physics laboratory. There I learned of “parity conservation,” a rule in physics that dictates that in a mirror-image world, objects should behave in mirror-image ways. For example, if you take a right-handed glove and turn it inside-out, a left hand ought to fit perfectly into it. Parity conservation would dictate that, indeed, there is no physical way to define “left.” Say you tried to give a Martian an experiment to determine what left is – maybe having him spin a ball and look at which way the side facing him is moving. If parity conservation holds, the Martian could unknowingly spin the ball the other way, walk away thinking left is right, and, when he finally visits Earth, get himself killed at his first London crosswalk. 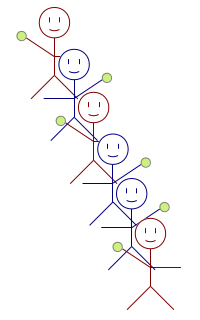 An intuitive version of the Lee/Yang/Wu experiment using single-file humans with tennis balls instead of cobalt. For decades, physicists believed that parity conservation was a law of the universe. But in 1956, three physicists – Chen Ning Yang, Tsung-Dao Lee, and Chien-Shiung Wu – made a startling discovery: in the world of nuclear physics, mirror-image particles don’t always do mirror-image things. To understand their experiment, imagine that you line up 100 people front-to-back, half righties and half lefties. You give each of them a tennis ball to hold in their strong hand, and instruct them all to hurl the balls away from their bodies. What could you infer from where the balls end up? You might see that the balls on either side of the line were, on average, thrown equally far. That’s probably the most intuitive outcome: it would suggest that a righty is exactly like a lefty, just inverted. However hard the average righty throws with her right hand, the average lefty throws exactly as hard with her left. But suppose you find a difference – the balls on the right, on average, went farther than the balls on the left. That would tell you that righties’ right hands and lefties’ left hands aren’t interchangeable. You’d know that parity conservation does not hold for righties and lefties. 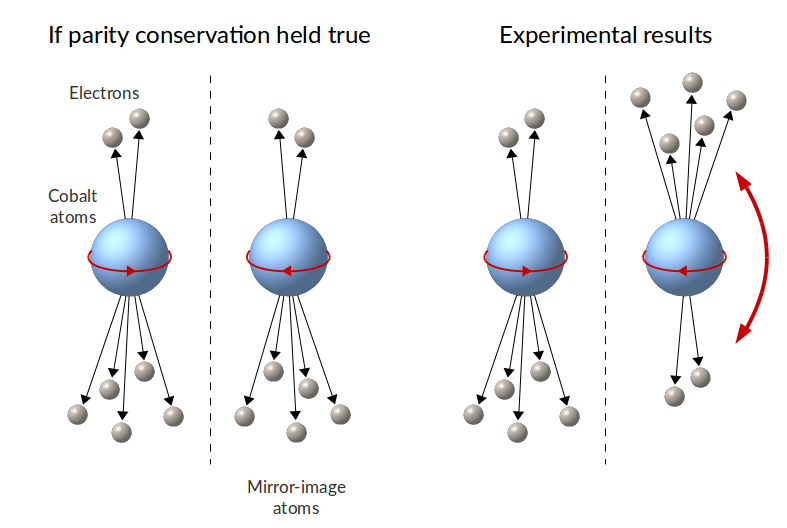 To visualize how the cobalt experiment works, imagine rotating the mirror-image atoms above by 180°, so that all the spins are aligned. If parity conservation holds, some atoms will spit more electrons up and some will spit more down, balancing each other out. If parity conservation does not hold, you’ll see more electrons coming out the bottom – you’ve turned all the clockwise atoms into counterclockwise atoms simply by rotating them. It’s as though you could turn a right glove into a left glove just by rotating it – they must not have been true mirror images in the first place! This is almost identical to the physicists’ experiment, except that they used radioactive cobalt atoms instead of people. These atoms each have an inherent spin direction – they’re all either clockwise-spinners or counterclockwise-spinners. Being radioactive, they also periodically spit out electrons as they break down. Yang, Lee, and Wu oriented a bunch of cobalt atoms so that they were all spinning counterclockwise when viewed from above, and counted the number of electrons popping out above and below. If the counts were equal, that would mean that a right-side-up counterclockwise atom was the same as an upside-down clockwise atom – parity conservation would hold true. But to everyone’s astonishment, the scientists found that more electrons came out the bottom. Somehow, nature cared whether a cobalt atom rotated clockwise or counter! In truth, it gets a bit more complicated – that definition relies on the fact that our universe consists of mostly matter, rather than antimatter, and the reasons for that remain a fundamental mystery of physics. For those details, though, I’ll have to leave you in the competent hands of Radiolab. I’m so excited that I can definitively tell my right from my left that I’ve got to share with someone. Time to go find me a Martian! When I was 3 or 4, I didn’t know my right from left, but I did grasp the concept that there were only two of them. I remember helping my mother make her bed one day, and this great idea popped into my head. Without any formal understanding of probability, I figured that I had a good chance of guessing my left and right correctly, and if I did, I was sure to impress my mom. So I pointed to what was actually the left pillow and said, “This is right,” and to the right pillow and said, “This is left.” My mother corrected me. If only I had thought to respond to her with “No, I mean if you are lying on your back on the bed.” But I forgive my 3- or 4-yr-old self for missing that chance at redemption. The point: Until now, I have taken great comfort in the possibility that my alternate-reality Martian mother might have been very proud of me that day. Which is why sailors use “port” and “starboard”. 🙂 After spending a couple of years on a ship, I began to want to start using it in other parts of the world as well!